With over 3000 KM of shoreline, Ireland is home to some epic surf spots. In the early autumn light, surfers around Ireland are out till two hours shy of last call, and make it a point to watch darkness fade as they catch their last wave into shore while making a beeline to the pub around the corner. With the fierce waves, colder water temperatures, and pretty awesome places to grab a pint, Ireland is the ‘it’ spot for surfing. The surf spot of giant proportions. Aileen’s, located just off the 214m-high Cliffs of Moher is one the greatest big wave spots, soaring as far as the eye can see to at least 12m high. With the Cliffs as your backdrop, big-wave surfers around the globe challenge their skills at Aileen’s with a few successful stories along the way. Please do not attempt this wave if you aren’t a seasoned big-wave rider. 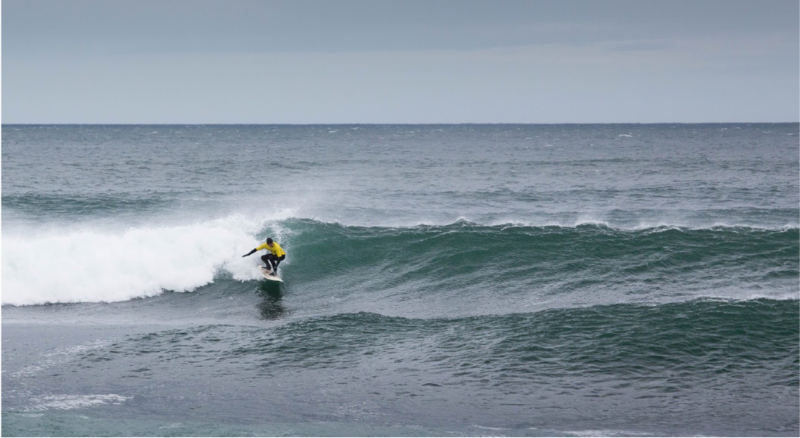 One of the most famous waves in the world, The Peak in Bundoran is famous for its fight to save the reef from a marina development as it’s home to some pretty solid waves. When it’s on, the flawless hollow right and high-performance lefts are crowded. Low tide is the best time to surf here, and watch out for poor water quality (after a rain), rocks and riptides. This no longer secret surf spot, is big, fat-lipped and barrels for days. If you’re a mid-level surfer, this is not the spot for you, advanced surfers only. Head off the beaten track to find the break and get ready for the barrel of your life. 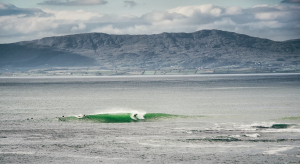 Ireland’s surf mecca. Golden sandy beaches, a reliable beach break and fast hollow waves at low tide, Tullan Strand is a great break for beginners and experienced surfers. 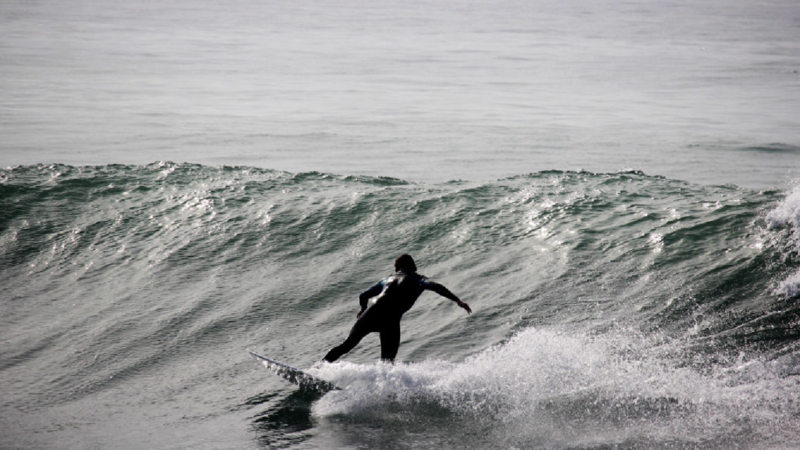 If you’re new to surfing, visit one of the many surf shops in Bundoran. Looking for a more mellow wave, head down the beach for a less-crowded spot. With a right a left break, this spot is the ‘it’ spot on the Ireland surf scene. Located mid-northwest of the country, the left is a consistent reef wave that rises approximately 10-15 feet high when the swell is on. With it’s rocky bottom, we recommend being an intermediate to experienced surfer here as this break can get quite crowded when it’s on. This fun little beach break is a great longboard wave for a summer ride. If you’re looking for a little larger waves, venture to Strandhill during the winter when the big swells roll in. Right and lefts, clean, good surf is on the horizon here. A fun little surf town, Lahinch is home to a sweet surf spot. Advanced surfers take to surfing right in front of the surf shop, which is always busy. If you’re a beginner, we recommend taking a lesson or two. Around the corner from world famous golf course, the Ballybunion Golf Club, Ballybunion world class surf break is of epic proportions. 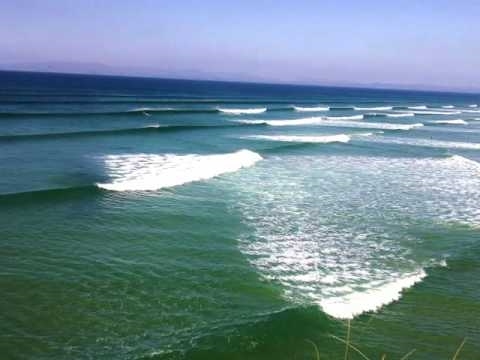 Home to North Kerry’s best surf spot, this wave is great for beginners and advanced surfers alike. When you’ve finished surfing your heart out, test your luck on the golf course. Pubs, pints and good food. Fish and chips, and creamy pints of Guinness await you and your buddies after you’ve surfed your hearts out. It’s only customary you stop at a pub after a surf (and everyday on your vacation), as the beer never stops flowing. Here are a few of our favourite spots. 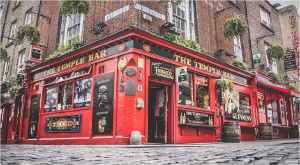 Ahh, the famous Temple Bar neighbourhood, a favourite among tourists. As you stroll the streets you’ll wish you were Irish all day everyday. The eclectic array of pubs are matched with perfectly manicured cobblestone streets that lead you into each and every perfect pub. No matter which pub you grab a pint in, it’ll be love at first pint. On the main street of Enniscrone (another favourite surf break) lies this quaint traditional Irish pub. The Pilot Bar is the perfect place to grab some grub, a pint of beer and keep warm after you surfed your heart out. After a surf session at Tramore, head off to Source, a favourite among foodies around the country. A high-class restaurant, Source is a great spot if you’re looking to relax and enjoy the view. This family-owned bar and restaurant is quite possibly the greatest place to enjoy a pint while overlooking The Peak, the North-West surfing mecca. From creamy pints to delicious pub fare, the surf vibe here is off the hook. A visit to Ireland isn’t complete without a tour of the famous Guinness StoreHouse. Go on a guided or self-guided tour of the joint to see just how the dark ale is made to your liking day in and day out. At the end of the tour, enjoy a pint or two of the good stuff. If you’ve ever dreamed of surfing in Ireland, contact us here to learn more about our Ireland excursions,and experience it for yourself.